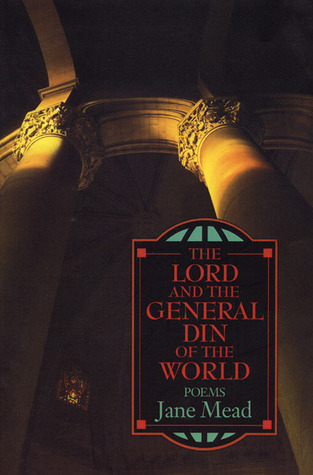 Re-reading The Lord and General Din of the World, I'm conflicted in all the normal ways, as Jane Mead has been my warm and friendly acquaintance in the art form of poetry almost since the beginning of my writing it, when I sat across the table from her in a Jorie Graham seminar at Iowa on the dramatic monologue. When in 1996 this book first appeared (ten years after that seminar), I was moved by the soulful doggedness in Mead's language, the way her poems moved away from and toward words' rich slippages, the way she was brave enough, in witnessing her own mud-caked hands drying in the rows of grapevines at the close of "Where the Zinfandel Pass Their Seasons in Mute Rows," to characterize the cracks as mere "rivers" and leave the trope there, no more explained than the acknowledgement of the body's as well as the mud's embeddedness in the drainage, the singing loss of an existence. That poem strikes me still as superb, but in the middle section of this three-section book I now become aware of from whom Mead is getting the news, and the aspect of sincerity, itself an embed within the poetics of the mid-Eighties, with its jargon of sincerity, and its solemn acknowledgement in the passing of James Wright, George Oppen, as well as Theodore Roethke, Berryman, and the rest, of sincerity's failure to find a languaged world, troubles my reading of the book whenever the work is perhaps most personal, where Mead, trying to find the poem in the recovery she had made from the crises in whose modality the book is most vivid, moves away from her family's addictions and has nothing but her own waywardness to record. To compound further my initial conflict, I must add that when I first read Mead, in 1996, I lacked, and indeed have only recently discovered, in the advent of Google, as such information becomes readily accessible, her beyond-Merrillean extraordinary family biography: on her father's side (and the father's struggles are very much at the center of this book's first section), a father who was the curator of fishes at a zoology institute at Harvard, and a Napa Valley vintner; her father's father, the co-founder of Union Carbide, the chemical company responsible for patents that formed the intellectual basis of the petrochemical industry, as well as countless technological innovations through the mid-part of the American Century, to say nothing of the company's responsibility in the Hawks Nest Disaster, and at Bhopal. And on the mother's side, gifted, even socially committed scientists among the great aunts and grandmother, each the progeny of Thomas Hunt Morgan, the Noble laureate in biology, whose work on the drosophila fruit fly laid the groundwork for the development of modern genetics. It's a cultural achievement matched only by a material one, and reading Mead's work without an understanding of it must be akin to reading Lowell's work as if it was written under a pseudonym. If we are to decide how Mead's style at once appeals to her reader and maps a location within this rather daunting record of cultural ballistics that is and has been her family's work . . . I return to something apparent in her remark to David Lehman when he included her "Concerning the Prayer I Cannot Make," in The Best American Poetry of 1991. Asked about the origins of that poem, Mead wrote: "I'd been trying to write a poem that was really about this poem. . . Now, when a poem isn't going well, I try to remember to ask myself, 'Well, what do you really mean?' and sometimes that helps me get to that moment when you quit creating and just go with the deeper saying of it. "The struggle we find in language to have meant something of our own precision, the movements from that struggle, or motive, into a world observable through having been "made up" by sometimes quite extraordinary persons, these movements Mead's poem awakens to the larger orders of a language Mead chooses not to use her own linguistic mastery against. In this choice, the orders of mastery become again human ones -- and I say this for myself, now, only identifying with Mead's having to locate herself within a family whose scientific positivism reached a quite daunting scale. But then let us admit that the identification always threatens to become an infatuated one, and Mead has more than met the threat in discretion. It's always a pleasure to return to books, and to find that your new reading doesn't come close to the original reading you had for the book. I can vaguely remember the first time I read General Din, and trying very hard to discover a biography lurking somewhere behind the poems. I felt their lyric voice emerged from a pained silence, and I found pleasure in the quiet voice that was the result. On reading it this time, I can see there is a greater consideration of truth as a necessarily self-fashioned understanding. "LaGuardia, the Story" is a good example. Here the speaker offers two separate versions of the same story, and she seems equally accepting of either version. Whatever is true is far too complicated to really understand. The first line of the first poem: "Jesus, I am cruelly lonely" sets the tone for the emotional depth of this book. The vulnerability of the speaker in these poems is paralleled by Mead's imagery. Not my jam-- got a little bored. The first section was the most interesting with lots of drug and family drama, accompanied by the requisite guilt, doubt, horror, anger. Some lovely, lovely lines there. The chickens poem alone is 5 stars. Damn, Jane Mead.